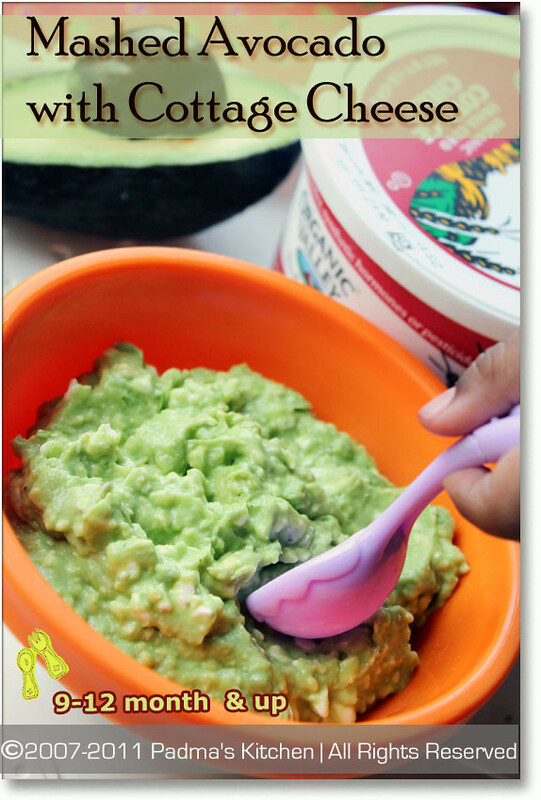 Like I promised in my previous post, presenting here avocado recipe for infants/babies and toddler. We knew that Avocados are so good for everyone but they are helpful for babies too! The fatty acids and unsaturated fats helps in their brain development. 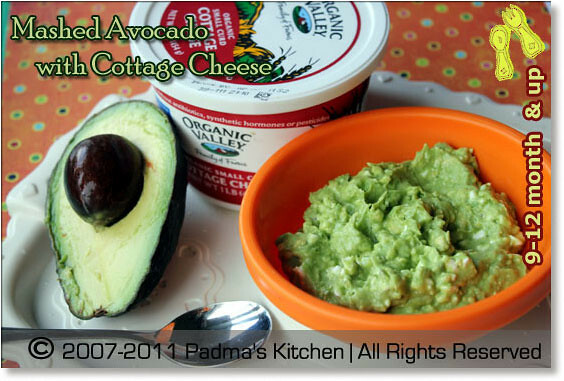 Cottage cheese is another source of protein for your little bean! So when combined together; this recipe is an excellent source of calcium, protein and omega3's for the growing needs of your baby. I introduced avocado to my little one around 10th month, I know it was late; but I was in India (for 4months), so after coming back I tried giving her, I was a bit apprehensive at first, little skeptical if she will like the taste. But she surprised me!! she wanted the whole bowl of freshly mashed avocado!! I was so happy that she enjoyed eating it and eagerly waiting/looking for spoon after spoon. Eventually I tried to give her all sorts of baby food and one day I brought home this book from library called "Everything about Baby food" and it has all the fabulous recipes using cottage cheese. I tried all the different tastes for my little one to see if her taste buds were working perfectly, she ate scrumptiously what ever new recipe I made for her! She was/is a happy child when ever I fed her avocado with mashed cottage cheese. Even today when I was trying to take the pictures for this post my LO was spooning some from the dish. The recipe is very simple and no cooking involved!! Always use fresh ingredients while feeding your baby. When feeding cheese's or milk products try to buy pasteurized and organic products which are very safe for your baby. As your baby gets older, introduce more variety into her diet by experimenting with these other types of cottage cheese. Cut the avocado into half, peel and fork mash it on a plate with cottage cheese and continue fork mashing until the mixture is at desired consistency. Add salt and pepper sparingly. If you feel the mixture is still too chunky, try fork-mashing in some yogurt, breast-milk, or formula. Serve it fresh. If there are any leftovers you can eat that with whole grain bread, used this mixture like a spread or just eat plain. Check my previous post "Everything about Avocados for Infants, babies and toddlers" for more info on avocados and how to store the other half of avocado. What a nutritious meal for the children. Great post!